RF-SMART has been delivering excellent software products to the market for more than 30 years, and we believe our greatest asset to our success is our people – our employees and our customers. Over the years, we’ve received numerous awards verifying that very thing. ICS Inc. received the 2017 Honeywell Partner Excellence award for its customer service, sales excellence and innovation. As a platinum partner with Honeywell, RF-SMART (a division of ICS) surpassed its business goals by delivering superior value to its customers. ICS Inc. was recognized as one of the fastest growing companies in America, ranking among the Inc. 5000 list. This list is the most prestigious honor a growing private company can receive. ICS Inc. was recently recognized as one of the 50 fastest-growing, private companies in Northeast Florida by the Jacksonville Business Journal. To be eligible, the company must have overall revenue growth from 2014 to 2016, revenue gain from 2015 to 2016, and have had annual revenue of at least $1 million in 2016. 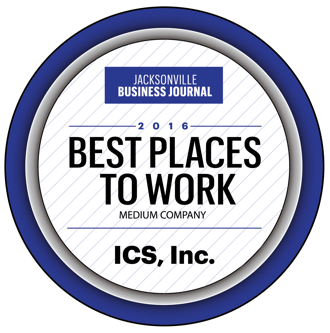 ICS Inc. was recognized as one of the best places to work in Jacksonville for 4-straight years in a row, based off an online survey where employees are given the freedom to answer questions honestly about their workplace. ICS Inc. has annually been recognized by the Jacksonville Business Journal as one of the top companies in Jacksonville owned and operated by ethnic minorities. ICS Inc. ranked among an annual list of the best Jacksonville Software Development firms. RF-SMART Chairman and former CEO, Jorge Morales, received “The Ultimate CEO” award, in recognition of Northeast Florida’s best CEOs. Jorge was honored for having a strong record of innovation and outstanding performance, as well as a sphere of influence outside of his career. RF-SMART has seen a number of employees recognized in this annual list comprised of local up-and-coming professionals making a difference in their community and industry. The winners range from a variety of backgrounds and industries but all possess the desire to succeed. ICS Inc. was listed among the Healthiest Employers across Northeast Florida. To be included in this list, a company must demonstrate evidence of an employee wellness program.